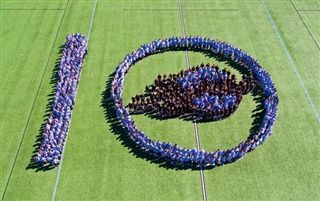 During Community Life March 2, students, faculty, staff, and members of the Board of Trustees joined together to take an all-school photo on the athletic field. The photograph represents how much the school has grown in the past ten years, from 108 students in 2007 to nearly 600 today. A drone was able to capture the whole community in a single frame. Afterwards, students and faculty enjoyed a catered picnic on the lawn.